Ave, everybody. Not much new here in a very, very long time. I did just finish placing all the articles into a menu up top, but I'm afraid I have no new posts to add. Back in 2000 I started RedRampant.com as a way to teach myself HTML. I figured there was no better way to learn, than doing. I had a fanatical interest in the Roman army at the time, so that was the focus of my self-taught web-design lesson. The site grew quite popular. Yet, I was not happy with the monthly web hosting costs, especially since I really wasn't adding to it very much in recent times. I am still very keen on all things ancient Rome, but my free time has been spent elsewhere the past couple years. To save money and keep the content on the web I moved RedRampant.com over to this blog format several months ago. I will continue to add new articles. I just hope you readers will forgive the sporadic nature of these additions. I have been doing illustrations for Ancient Warfare Magazine the past couple years. If there is an interest in seeing in-progress pics I will post them here. I like to debut the completed illustration in the magazine itself. Once it's off the shelves, I might post completed images on this blog. 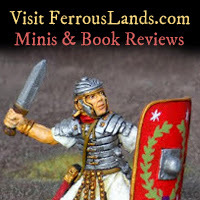 Last year I started FerrousLands, a hobby blog for my historic miniatures painting and tabletop wargaming. It takes a lot less time to paint and photograph a 28mm Roman miniature than it does to research a topic and carefully write a scholarly article. So, that site has been getting most of my attention. It's a fun way to express my interest in ancients. In fact, I just posted a new photo of some painted 1/32 scale Roman toy soldiers. Since 2006 I have been researching my grandfather's outfit in World War II. I'm close to finishing a book on the subject. The writing has totally consumed all my free time as of late. I expect I will be finished by the end of this spring. The finished product will half text half photographs/illustrations, much like an Osprey Publishing or Shire Books title. Once the book is published leisure time will return, and with it new RedRampant articles.